Brad and I frequently work late. Too many nights we find ourselves sitting in our studio when one of us says “Sh*t! It’s almost 9:00, we’d better go home.” And while irrational hunger and fatigue will occasionally force us to give in to the ease of NYC take-out, I try to motivate myself to make dinner as usual. I spotted some good looking stuffed pasta in the freezer of our food coop last week and snagged them for a night such as this. Add some asparagus from the greenmarket and some good Parmigiano-Reggiano, which I always have on hand, and presto! dinner in 20 minutes. Which also happens to be the perfect amount of time to have your after work cocktail while cooking. *Certain sauces and ingredients are best paired with fresh pasta, which I love to make but rarely have the time for. If you’re in Brooklyn, Union Market carries fresh pasta from Rafetto’s – these West Village peeps are the real deal, as in, been in the fresh pasta business since 1906. I also like the pasta from Russo’s on 7th avenue near 10th street in Park Slope. If you’re in NYC, I’d also recommend you make a pilgrimage to heaven on earth, otherwise known as Buon Italia in the Chelsea Market, where all your fresh pasta and Italian ingredient dreams will come true. 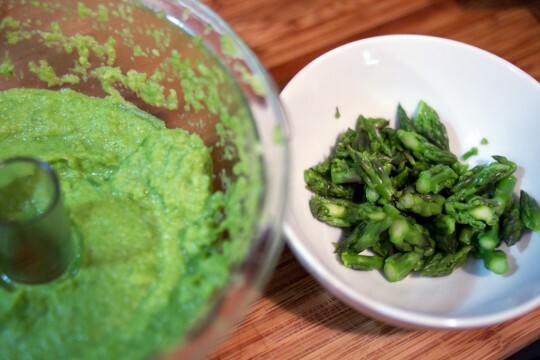 Asparagus puree, save the tips for flair! Set your pasta water to a boil with a generous amount of salt. Set another saucepan to a boil with salted water*. Cook the asparagus pieces (remember to trim the tips and reserve) in the saucepan of boiling water until tender, about 5 minutes. Remove with a slotted spoon to a food processor and puree. Meanwhile cook the tips in the boiling water for about 2-3 minutes until crisp tender. Drain and rinse with cold water to stop cooking. Cook the pasta as directed (fresh pasta will only take about 2 minutes, but if it’s frozen, more like 5. They’re usually done when they float to the top), and reserve 1/2 cup of the cooking water before draining and returning to the pot. Gently toss the pasta with the asparagus puree and 1/4 cup of the reserved water (add more if needed – you want it to be smooth and saucy without being too liquidy). Add the asparagus tips, a good splash of olive oil, and salt and pepper to taste. Give it another quick toss or two and spoon into dishes. Top with generous grating of cheese and enjoy! *Variation: the asparagus season is fleeting, but soon the sweet peas will be here! The idea for this came from this recipe by Giuliano Hazan which I made last summer. I’d simplify based on my recipe above: In lieu of asparagus, blanch the fresh shell peas, puree 2/3 with some lemon zest and a splash of juice and save the remaining 1/3 to stir in whole. Try it with good, fresh tagliatelle. Riff on this, just go for it.